For some people, throwing clay on the pottery wheel can be addictive. If you are one of those people, you have come to the right place. In this section of Ceramic Arts Network, professional studio potters provide instruction as well as inspiration for anyone wanting to learn, improve and master techniques on the pottery wheel. Browse these articles and videos for helpful information such topics as altering wheel thrown vessels or trimming large platters with complex rims. For a tool that really does one thing (spins in a circle), the number of techniques and results possible on the pottery throwing wheel are just astounding. From more traditional wheel thrown pottery to gestural thrown and altered pottery, the sky’s the limit on the creativity that can come from the wheel. Strengthen your pottery throwing skills with our free throwing guide Five Great Pottery Throwing Wheel Techniques: Tips on Throwing Complex Pottery Forms Using Basic Throwing Skills. Whether you learned to throw on an electric pottery wheel, or a traditional pottery kickwheel, there is always more to learn and Ceramic Arts Daily is the place to find great instruction and inspiration to help improve your skills on the pottery throwing wheel. If you’re looking to tackle a certain form you’ve never made, chances are you’ll find the advice and tips you need in our article archive. Or if you just want a boost to your creative juices, we’ve got that too! 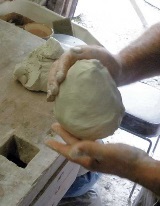 From tips on centering large amounts of clay, to how to create your own travel mug, to using wheel-thrown parts to make abstract ceramic sculpture, there is enough pottery throwing information to keep you busy for a good long while! And, if you haven’t already, be sure to download your free copy of Five Great Pottery Throwing Wheel Techniques: Tips on Throwing Complex Pottery Forms Using Basic Throwing Skills, which includes detailed well-illustrated, step-by-step pottery making projects by nationally known potters, teachers and workshop presenters.